The Nilgiri Mountain Railway, which runs between Ooty and Mettupalayam, is a UNESCO World Heritage Site. 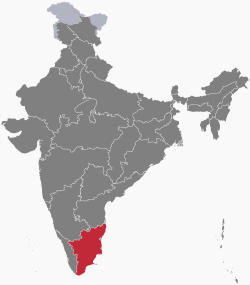 Ang Tamil Nadu (Padron:IPA-ta literally 'The Land of Tamils' or 'Tamil Country') ay isa sa 29 estado ng India. Itong kabisera at pinakamalaking lungsod ay Chennai (dating Madras). ↑ "Tamil Nadu: Girija Vaidyanathan is the new chief secretary". Deccan Chronicle (Tamil Nadu). 23 December 2016. http://www.deccanchronicle.com/nation/current-affairs/231216/tamil-nadu-girija-vaidyanathan-is-the-new-chief-secretary.html. Hinango noong 31 December 2016. ↑ "Rajendran is new DGP". thehindu.com. http://www.thehindu.com/news/national/tamil-nadu/Rajendran-is-new-DGP-George-is-Commissioner/article14628490.ece. Hinango noong 18 October 2016. ↑ "Census of india 2011". Government of India. http://www.censusindia.gov.in/2011census/PCA/PCA_Highlights/pca_highlights_file/Tamil_Nadu/6.Figures_Glance_Tamil%20Nadu.pdf. ↑ "Tamil Nadu fin_budget_speech_e_2018_19". http://cms.tn.gov.in/sites/default/files/documents/fin_budget_speech_e_2018_19.pdf. Hinango noong 15 March 2018. ↑ "Why Kerala is like Maldives and Uttar Pradesh, Pakistan". http://www.livemint.com/Politics/3KhGMVXGxXcGYBRMsmDCFO/Why-Kerala-is-like-Maldives-and-Uttar-Pradesh-Pakistan.html. ↑ "IWhy Kerala is like Maldives and Uttar Pradesh, Pakistan". http://livemint.com/Politics/3KhGMVXGxXcGYBRMsmDCFO/Why-Kerala-is-like-Maldives-and-Uttar-Pradesh-Pakistan.html. ↑ 8.0 8.1 "52nd report of the Commissioner for Linguistic Minorities in India (July 2014 to June 2015)". Ministry of Minority Affairs (Government of India). 29 March 2016. http://nclm.nic.in/shared/linkimages/NCLM52ndReport.pdf#page=137. Huling pagbabago: 09:15, 6 Hulyo 2018.